We grew up in a tall yellow house on Rainbow Row with a decent collection of cookbooks, many of which our mom bought at John Martin Taylor’s dearly missed shop, Hoppin’ John’s. Paula Wolfert’s Mostly Mediterranean was on the shelf and a paperback edition of Julia Child’s Mastering the Art of French Cooking, which we cracked for the first time in 1987 to make boeuf bourguignon for a meeting of the Porter-Gaud French Club. Besides Charleston Receipts, Mom didn’t own many Southern volumes of recent vintage, so when Taylor’s own Hoppin’ John’s Lowcountry Cooking arrived, she bought a copy. Until then, we’d known Taylor as a puckish, erudite presence, darting about the store and sometimes to his apartment above to check on the stove. Reading his book, we came to know him better through his stories of a genteel boyhood, gathering crabs from the May River near Hilton Head, sailing on Sunday afternoons, and taking trips abroad (and down to his father’s wine cellar). It was an early lesson that a cookbook can be so much more than a gathering of superb recipes. Yes, the recipes have to work, yielding the kind of successes that inspire you to spend more time in the kitchen, but for us, great recipes should also be accompanied by compelling stories. When we recently took stock of our collection of Lowcountry cookbooks, we realized that what we especially love about them is how richly they dramatize the varied lives we lead here along the South Carolina seacoast. 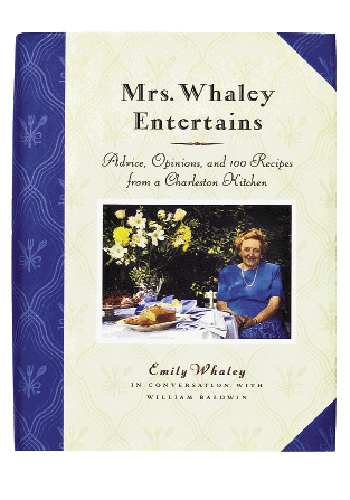 Take, for example, Mrs. Whaley Entertains, the cookbook that Emily Whaley, our former cotillion teacher, published in 1998. Her Shrimp Pie and Lady Baltimore Cake recipes are superb, and her evocation of South of Broad cocktail-party culture is completely in line with our memories of the formidable Tradd Street hostess, who taught us to dance the Lindy to CCR’s “Proud Mary” at Society Hall. But what was so revelatory about the book—and why we return to it often—is the way Mrs. Whaley lays down the truths of the domestic arts in a voice that is at once wise, theatrical, and—this came as a complete surprise—salty as heck! 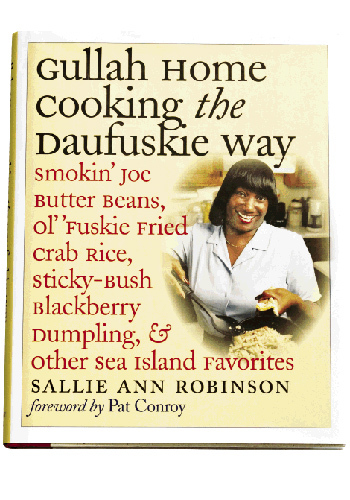 A similarly indelible voice on our shelf is Sallie Ann Robinson’s, whose Gullah Home Cooking the Daufuskie Way, shows us what it was like to grow up on remote Daufuskie Island in the 1950s and ’60s (which was more like the ’30s and ’40s on the mainland). She writes of considerable labors that yielded simple, bountiful pleasures: raising chickens, hauling firewood, foraging for wild blackberries, and hunting game birds. Today’s locavores can learn lots from this book, but it’s the lilting poetry to Robinson’s writing that makes it a pleasure to read. She was, in fact, one of Pat Conroy’s seventh-grade pupils when he was a teacher on Daufuskie in the late ’60s (an experience he fictionalized in The Water is Wide), so perhaps it’s no surprise that her voice is distinctive and lyrical. 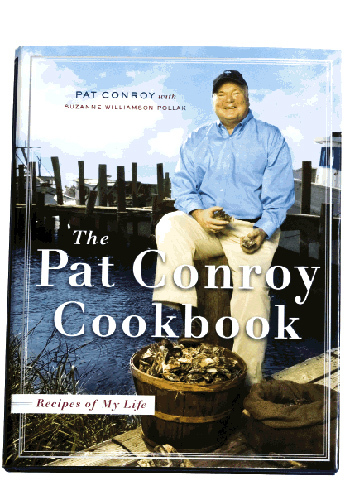 Conroy’s own cookbook, The Pat Conroy Cookbook: Recipes of My Life, is also on our shelf, and lest you think it’s a vanity project, just try his Bucatini all’Amatriciana or, for that matter, his collard greens. The recipes span the globe, as might be expected from a world-famous writer, but his appetite for the good life is Lowcountry through and through. The only quibble we have with the book is that it doesn’t come with a warning: this book will make you laugh—the doubled-over, head-hits-the-cabinet, drop-the-kitchen-knife kind of laughter. 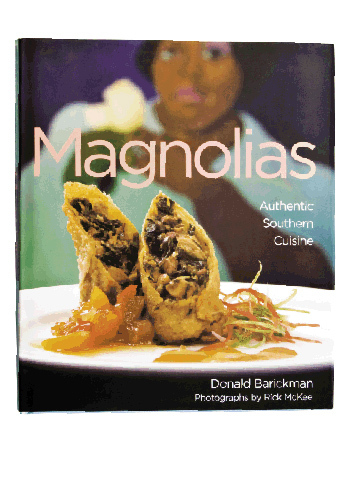 Charleston restaurants have issued books with some regularity in the last decade, and while we don’t do much restaurant-style cooking ourselves—we’ve never mastered the vertical presentation or the sauce squiggle—a book like Donald Barickman’s Magnolias: Authentic Southern Cuisine always reminds us just how much the town’s changed since the dining-out options were Henry’s, Perdita’s, and Le Midi. When Magnolias came on the scene in 1990, doing sophisticated bistro food with a Southern slant, it was like a breath of fresh air. Collard green egg rolls! Who knew? 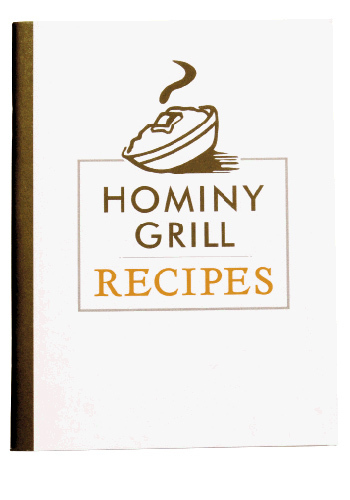 But our favorite restaurant-chef book may just be Robert Stehling’s Hominy Grill Recipes—as straightforward and fiercely independent as we’ve come to expect from a guy who serves Liver Pudding and Fried Bologna to guests for breakfast. It’s the humblest of the recent restaurant books—self-published, no glossy photos here (Charleston artist and fellow Porter-Gaud alumnus Tim Hussey did the illustrations)—but its 25 recipes are some of the most sublime in town. Go to Chicago or L.A. and make that Chocolate Pudding; if it doesn’t transport you instantly to 207 Rutledge Avenue, come back for a $12.95 refund. 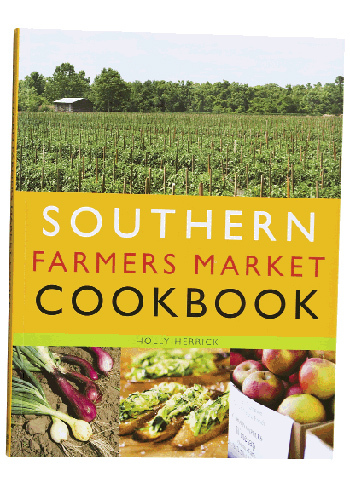 One very recent book that carries us to Marion Square is Holly Herrick’s Southern Farmers Market Cookbook, which brings a Massachusetts-farm-girl-turned-chef-and-restaurant-critic perspective to a locavore’s recipe bible. Herrick traveled to farmers markets all over the South to research the book, but Charleston is her home market, so to speak, and this book has special resonance for Lowcountry readers. Herrick’s philosophy of cooking what’s fresh that day—and building your pantry to support that style of cooking—is inspiring, encouraging us to shake loose our reliance on shopping lists and take our cues directly from the source. Nathalie Dupree’s Shrimp and Grits Cookbook, written with Charleston food editor Marion Sullivan, is a definitive and beautiful ode to one of our region’s great culinary icons. You never knew there were so many ways to prepare the dish! We recently told Dupree, a neighbor, that we thought she should compile all her books into a volume titled Mastering the Art of Southern Cooking. She replied that she’s working on a book with exactly that title, but that it’s a completely new and original work, forthcoming from Gibbs Smith in Fall 2010. It wasn’t until 2006 that we finally formally met John Martin Taylor in Washington, D.C. We were on tour with our first cookbook, and Taylor was interviewing us for The Washington Post. We told him how much we missed Hoppin’ John’s, and that more than ever, we needed a place like his: a cookbook shop curated with irrepressible passion and deep intelligence. Three years later, the need only seems more urgent.